Opening Day tradition – Welcome to the 2019 Beemie Awards! We all have some traditions in our lives. Some big, some small, some just out of habit moreso than anything. One of my favorite traditions I have occurs the night before opening day at track. It started the night before my first day at River Downs. I was sitting in my apartment in Cincinnati, this strange city with no teriyaki restaurants, and my nerves were pretty strong about the next day. I’d probably only called 11 races in my life at that point (over the air, I’d called hundreds just to myself), so they were taking a pretty big chance on me. Well I decided I was going to go out to dinner. So I went to what I was told was the best steak in Cincinnati, Jeff Ruby’s Precinct Restaurant. As it sounds, it was an old police precinct they’d turned into a steakhouse. And it was boss. 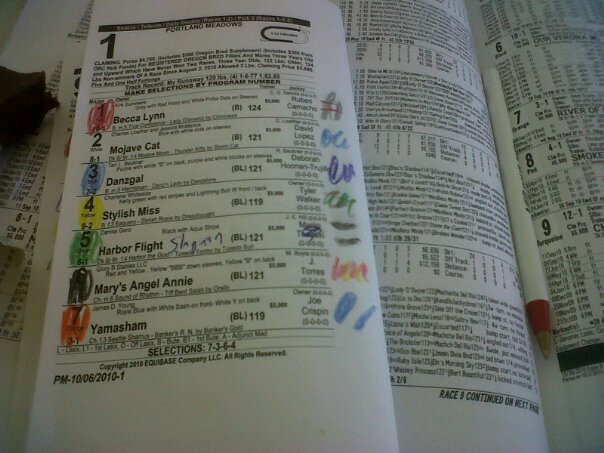 I brought my program and colored pencils along and colored in the silks of the horses just to the right of the jockeys names. Sat there and enjoyed my Rib-Eye, with a side of hollandaise. When dinner was over, I went home, full and now sleepy and popped in the great movie Let it Ride. I’ll never forget going to the track the next day, nervous as hell and the phone ringing 2 minutes before the first race. It was my friends from Portland Meadows and they said “Don’t answer the phone you got a race to call!” Dicks! So after that, each time a new meet would start, be it in Cincinnnati or here in Portland, I always go out for an amazing meal and color my programs. There was veal parmigiana at Ciao Vito on Alberta Street, a rigatoni at Nicola’s in Over the Rhyne, every form of pig at Higgins on Broadway, a petite filet at El Gaucho, and others. It’s a dumb tradition, but I love it and hope to keep doing it for a long time!